← Too Busy to Blog. Looking for a fresh, local, respectfully raised Thanksgiving turkey? We’ve got a few turkeys still available for the upcoming holiday. This year, we raised Narrangansetts and Midget Whites. 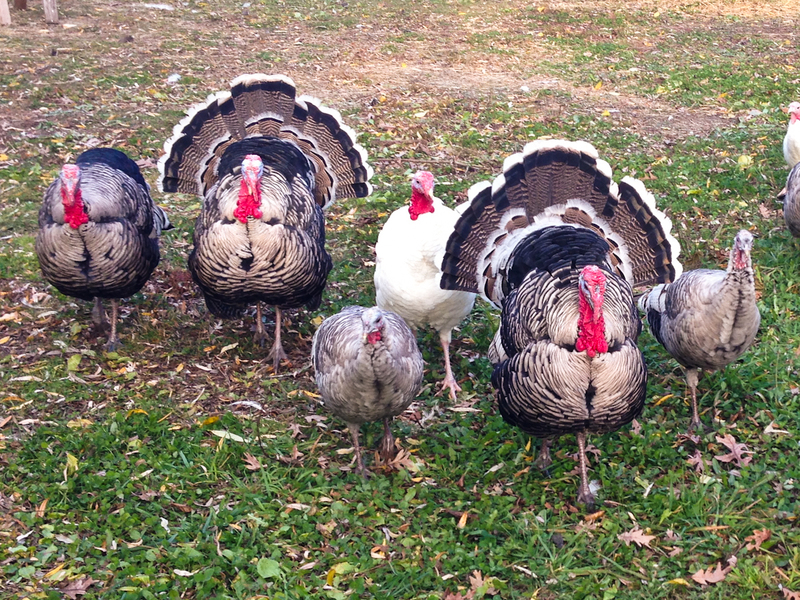 All of the turkeys have lived here since they were a day old, and have freely ranged since they were feathered out. They’ve had supplemental organic grain available free choice (when they were small, they had a non-organic ration, as an organic turkey starter feed wasn’t available). They’ve not had any antibiotics or medication at any time. In short, they’ve been turkeys, living like turkeys do. Sizes are expected to be in the 10-14 lb range. We’ll be processing them on the Tuesday before Thanksgiving (Nov 25), and they’ll be available for pickup (10 minutes SW of Madison) anytime between Tuesday evening and Thursday morning. $6/lb. To order, email us and describe the size you’re looking for. This entry was posted in Food, Turkeys. Bookmark the permalink.